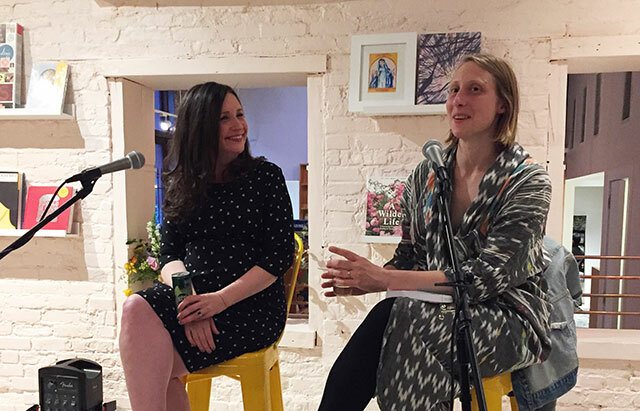 Books are Magic, the new Brooklyn bookstore from Emma Straub opened earlier this month. 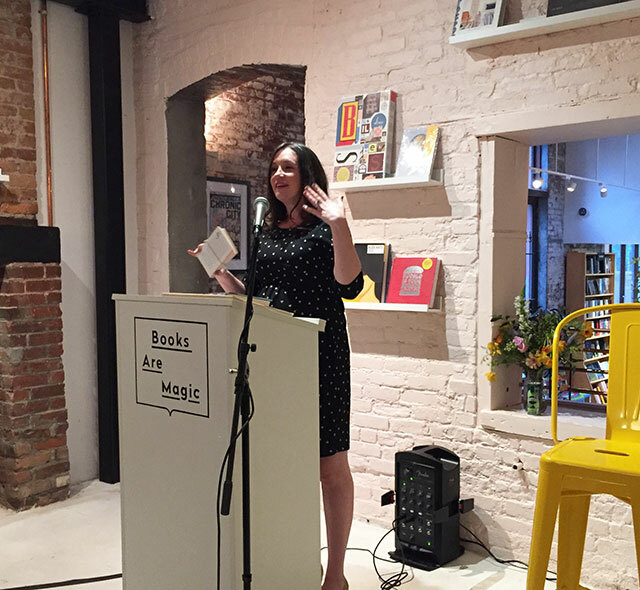 However the store’s true christening happened last week when J. Courtney Sullivan became the first author to have an event in the store. She read from her new novel, Saints for All Occasions. Joining Sullivan for discussion was Emma Straub. Saints for All Occasions follows the narrative of two Catholic sisters, Nora and Theresa. The two Irish immigrants arrive in Boston in the 1950s, and the novel follows them as Nora becomes a matriarch of a sprawling Irish-Catholic family family and Theresa enters a convent. Sullivan explains that the germination of the book began with an aunt telling her about this great idea for another book. Writers often have family members offering great ideas for books, but rarely are the ideas great. The idea her aunt had though was to talk to a close family friend who entered a cloistered convent. As a self-described, deeply lapsed Catholic, Sullivan thought this was definitely not the idea for a book. Eventually Sullivan wrote a letter to the family friend, and then eventually drove up to Connecticut to visit the convent. Their first conversation was in a room divided by a screen because of conventions surrounding the nature of cloistered convents. The family friend holds a doctorate in English Literature and first began visiting the abbey when she had been interested in communal living as a hippie. She and three childhood friends eventually joined the order. Now Sullivan had her interests piqued. Nuns need money, and they need new members. They can’t ask for money, leaving them perpetually in poverty. And there are restrictions on new recruits, leaving them short of young people. For instance, because property is shared among the nuns, new recruits can’t join if they have debt. The requirement is disqualifying many women with student loans. The nuns help support themselves by growing food on a farm. Sullivan was working on the farm with an elderly nun when the woman tried recruiting her. Sullivan explained that she was actually married, so it might not be a good fit. The nun persisted. “Some of the nuns had had husbands–so things can be changed,” she joked. Her obsession with nuns continued. She started writing a total of four novels about nuns before settling on the final novel. “I thought of being just the nun author,” she jokes again, although it still seems entirely possible from the way she speaks that every book she writes going forward might involve nuns. One thing that intrigued her is how cloistered nuns really do remain outside of the world. There are a few exceptions allowing short stints outside the abbey, like for family emergencies. This means though that nuns can encounter the modern world for brief periods of time. That presented Sullivan with the seed of an idea. Sullivan’s first novel, Commencement, was about four women at Smith College. They weren’t all that far from Sullivan herself. The big challenge was making each of those women distinct, but also real characters. She got bolder, writing about elderly women, and the real evolution was the ability to take risks. The first novel was successful, but there are still parts of it that Sullivan doesn’t like. She says she can point to a section where she didn’t want to do the work to improve it because at the time she wanted to watch America’s Next Top Model instead of writing. Like a lot of writers, Sullivan says her novels really start with a question she wants to answer. When she was writing this novel, she was working out the questions of having a child, and what motherhood meant (Sullivan is very pregnant). Sullivan’s Irish heritage is evident throughout her novels and make up a big part of her identity. It was very much part of her childhood. The generation that never lived in Ireland has a strong sense of their heritage, she explains, even more than the generation that actually left the island. There is a desire in America to be from somewhere, she observes. At one point, Sullivan visited Ireland and stood in a one room cottage where her relatives came from. It dawned on her that she was American because a seventeen-year-old Irish girl left Ireland with nearly nothing.